Pop Goes the Pie: More! What a lovely surprise to open my pie mail after a week of busy-ness and distraction to find two more windows waiting for me there! 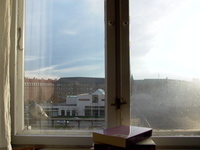 Anja sent me her view of the Copenhagen sky, with books in the foreground (she's writing her thesis) and a very Danish design-like pigeon perched on the sill. Hors-Sujet (Est-ce un sujet qui se trouve en dehors de lui même, ou plutôt un être qui n'as pas sa place dans le sujet?) 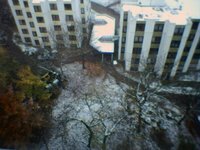 sent us the pigeon's eye view of his courtyard. I love that the trees on the left are still clinging to their fall leaves, while the other has surrendered to winter.